The species is widespread in parts of England, but otherwise very scattered as far north as central Scotland. It is widespread in north-western and central Europe. C. pallidula is typically found on trees and shrubs, on bark or by beating. An unusually high proportion of records are from gardens, both urban and suburban (e.g. five of the twelve sites in Leicestershire in Crocker and Daws (1996)). 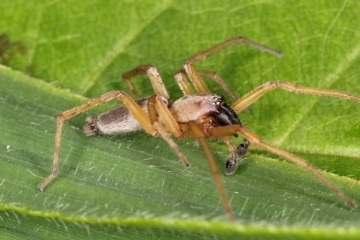 One female was found on eggs in a folded Yucca leaf in a suburban garden. It also occurs under stones, inside houses, outhouses and derelict buildings and in grassland. Adults of both sexes are found mainly in late spring and early summer, females occasionally until December. A male has been recorded in November in Leicestershire inside a telephone box. Local, but more common in the south.